Amazon is offering more than 40 percent discount on Home appliances such as washing machines during its Prime Day sale. We handpicked some of the best deals from brands like Whirlpool, IFB, Bosch and more. Today’s deals roundup is about Amazon Prime Day sale washing machine deals. In the list, we have covered the best deals from brands like Samsung, Whirlpool, LG and more. The Whirlpool Fully-Automatic Top Load washing machine offers the company’s 6th Sense technology and four wash programs for different types of clothes. The washing machine comes with an easy 1-2-3 operation that should make it easier for anyone to do their laundry. The other features include four different modes for water level and an auto-restart feature. Click here to buy. The BPL Fully-Automatic Top Load Washing machine has a capacity of 6.2Kg. The machine comes with a 24-hour delay start feature and with an air drier feature for drying out clothes. The company is also providing a one-year warranty that does not cover physical damage. Click here to buy. The Samsung 6.5Kg Fully-Automatic Washing Machine features an Eco-Tub technology that keeps your top-load washer clean and fresh without the need of any chemical cleaning agents. It is also equipped with a bunch of features such as Digital Inverter Technology, Diamond Drum, Smart Check, and Volt Control. The Samsung is also giving away three years comprehensive warranty and ten years warranty on the motor as well. Click here to buy. The Bosch Fully-Automatic Front-Load Washing machine has a capacity of 6Kg. The machine also has a built-in water heater and reload function. It should be noted that the company is providing two years warranty on product and ten years on motor. Click here to buy. The IFB Fully-Automatic Front-load washing machine comes with a capacity of 8Kg. The washing machine features an in-built tub cleaning feature that eliminates any impurities, bacteria and unpleasant smell from it. Moreover, users can also add more clothes while a wash is going on. Click here to buy. The Whirlpool Fully-Automatic Top Load Washing machine features a 6th sense 1-2-3 and power scrub technology. It offers 12 wash programs for a different type of loads. The machine also has a feature called hard water wash that provides 30 percent better wash when using hard waters. Click here to buy. 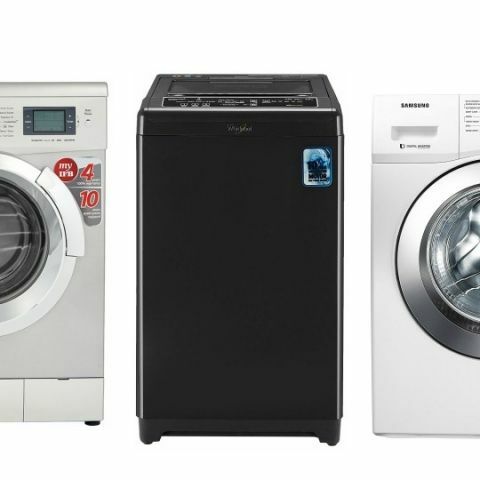 The Samsung Fully-Automatic Front Load Washing machine has a capacity of 6.5Kg. It offers features like Diamond Frum and even a touch panel. The washing machine is capable of a maximum spinning speed of the washing machine is 1000 Rpm that is directly proportional to drying time, which means higher the spin speed, faster the drying time. Click here to buy. The Whirlpool Fully-Automatic Top Load Washing-Machine has a capacity of 7Kg. It features a 6th sense 360-degree tumble motion technology that makes clothes rub against each other for better cleaning. It also has a built-in heater and power drier technology, which consists of four unique level of drying for a different type of clothes. The machine also has a smart sensor, smart filter, and smart detergent recommendation. Click here to buy. The LG 6.5Kg Fully-Automatic Top Load machine is equipped with a smart-inverter technology that efficiently controls the electricity usage. It also has a tub clean technology that prevents unpleasant smell emanating from the tub. Users also have an option to “quick wash” clothes and set their own program for a specific set of clothes. Click here to buy. The Lloyd Fully-Automatic washing machine features an intelligent washing sensor that automatically adjusts the washing conditions depending on laundry load. It also has a water recycle feature that doesn’t drain water of the tub and can be reused for next cycle. Moreover, it also features a Bubble Wash technology that activates the detergent faster and spread it throughout evenly. Click here to buy.